Over the past year or so it has become quite a trend for artisan drinks brands to offer a subscription service. 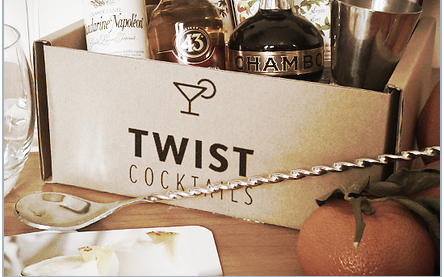 There's new ones popping up all the time, each one trying to outdo the other in terms of fancy ingredients or wacky concepts, but I think Twist Cocktails' brand new service is exciting for an entirely different reason: it's flexibility. 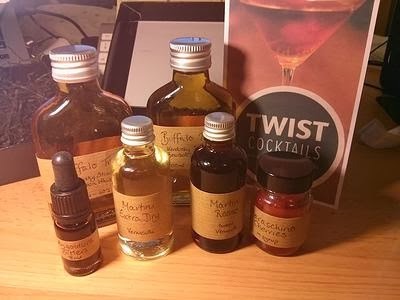 Twist Cocktails offer a wonderful, reasonably-priced cocktail subscription service - one they only launched yesterday, but I've been waiting impatiently to tell you since I discovered what they had planned a few months back - which is themed around a different cocktail each month. Basically, when you sign up (or indeed buy a one-off box - that's fine too) they'll send you a pretty box containing all the main drinks components of a particular cocktail (using only premium brands and producers) plus some recipes and fun trivia and interviews for fact fans. They don't necessarily include absolutely every ingredient - if you need something like a squeeze of lemon or an egg white they'll let you know to have it ready - but they do make that completely clear to give you time to prepare. The best part? It's what they call a 'soft subscription' - once you've signed up, they'll send you the first box (this month it's a Manhattan box) but for all future months they'll contact you to let you know what the box is and ask you to confirm you definitely want it before they send it. You're under no obligation to buy any particular number of boxes. That's pretty good, especially for fusspots like me. The monthly cost is £24.99, which I think is pretty reasonable bearing in mind there's always enough to make 3 or 4 cocktails in each box. You'd easily spend that in a cocktail bar (even a relatively down-market one) and this way you don't even have to leave the house. Oh, and they also do a one-off mixologist kit for £29.99 in case you need your jiggers and shakers. Now who wants to send me one to try for myself?